Help support the public television outreach "A Simple Piece of Paper". Every dollar donated goes directly to the grassroots outreach. No funds are used for salary or overhead. You can join our effort today by clicking on the 'Donate' button below. access to their original birth certificates? 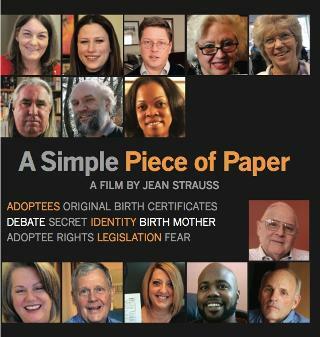 Most adoptees in the America are never allowed to have the record of their own birth. But in the last fifteen years, a number of states have reversed sealed records laws. From Oregon to Maine, thousands of adoptees have now received their records, and a number of states are considering similar legislation. Opponents have argued that birthmothers were promised confidentiality, but there is no statutory guarantee of privacy – and upwards of 98% of birthmothers indicate that they would welcome contact and/or the sharing of information. In 2011, Illinois became the largest state in the Union to provide adoptees this right, providing 350,000 adoptees access to their records. A Simple Piece of Paper examines the impact of the release of these records, following a handful of the first people to receive this record. Their heartwarming – and heartwrenching – stories, provoke a new question: what would have happened if the state of Illinois had been able to do this sooner.